Features a cushioned, non-skid, rigid rocker sole and moulded heel counter for comfortable support and complete, shockabsorbing stabilization. Durable soft inner lining allows foot to breathe while moulded heel collar contours around heel for a better fit. 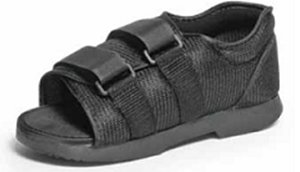 D-ring closure ensures even compression and adjusts to accommodate bulky dressings and edema, while open toe design helps prevent friction on toes.